Our front stairs are really tight and awkward. A few visitors have suggested that we rip them out and put in a more modern version. I refuse. I love the charm of our old house. I just need some wallpaper and better light like the image above from smosch.com. 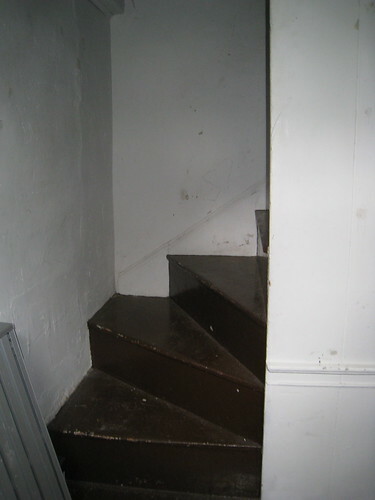 Below is a shot of our stairs when you first enter the house. Should you get a copy of Charles Sheeler's Stair painting and hang it on the little wall we see?. What a coincidence …. Beautiful rendition. But … be leery of using a wide striped wallpaper in your hallway if your walls are not true and straight. Old Town house walls have a life of their own. I see what you mean. Like this one…. wow that second photo totally looks like the charles sheeler painting. Love the stairs! Paper will be fantastic. Ooh! I love the wallpaper idea! I can see why some would suggest to replace the narrow staircase, but I'm with you on loving the charm :) For sure, cute wallpaper would highlight the charm! I'd paint them red, with glossy deck paint! Definately stick to your guns and keep your stairs with their wonderful character; perhaps you could paint them a lighter colour. A random pattern wallpaper will help disguise the lumps and bumps in the wall too.